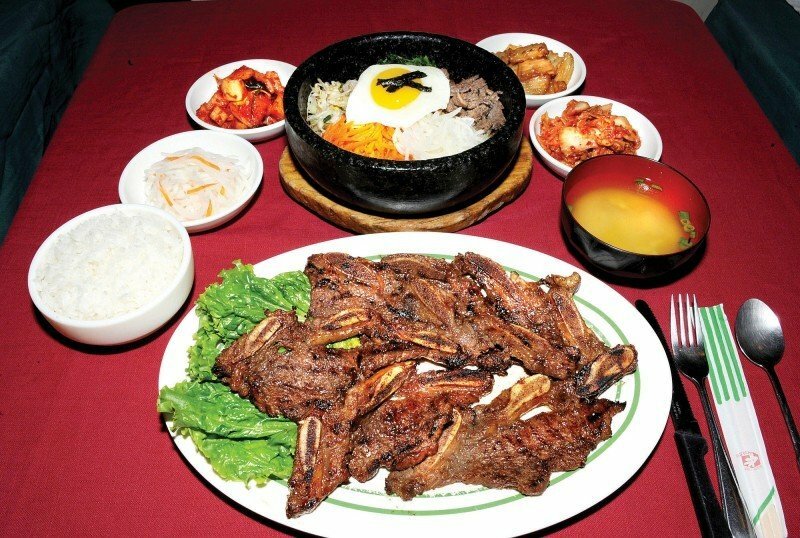 Galbi, char-grilled short beef ribs, (front) with bibimbop in a stone cooker and side dishes from New Seoul Korean Restaurant. New Seoul Korean Restaurant has been open on Old University Avenue for nearly 20 years. Korean food doesn’t come close, in terms of popularity, to other Asian cuisines. Yet New Seoul, on Old University Avenue, has soldiered on for almost two decades with its version of Korean home cooking and simple decor. 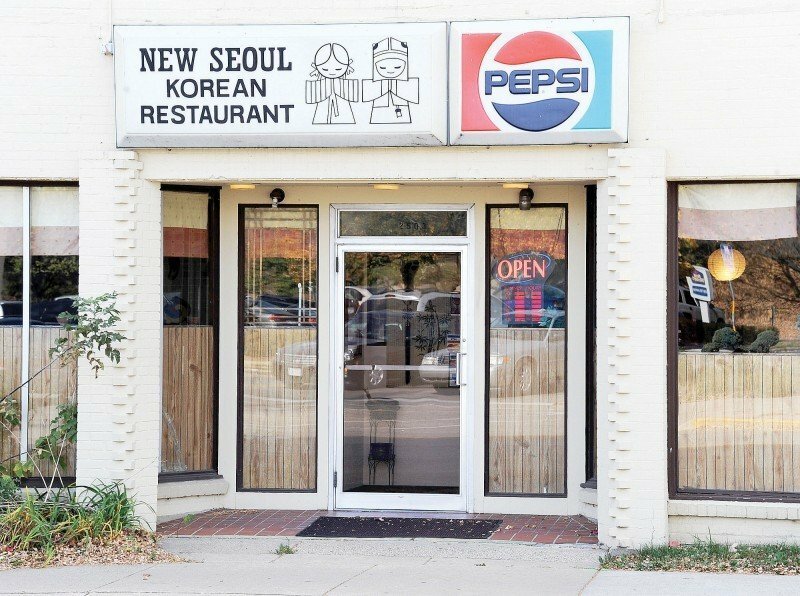 Since the recent closing of Coreana, it’s now the only full-service Korean restaurant in Madison. Korean meals are not served in courses; instead, all the food appears on the table in one fell swoop. Small bowls of vegetables, which replace salads, are meant to be shared. The spicy fermented radishes, potatoes, and cucumbers were pleasantly spicy, while the pungent kimchi was less fiery than most. An appetizer, kimbop ($5.50), looked exactly like a sliced Japanese sushi roll. Wrapped in the dried seaweed were sticky rice, fish cake, fried egg, as well as pickled radishes, carrots and spinach. A vegetable egg roll ($2.50) was filled with crisp, fresh cabbage, carrots, and onion in a lightly battered wrapper. Miso soup ($1.95), with bean paste, tofu and green onion is another item familiar from exposure to other Asian cuisines. Samsun Jambong ($10.95) is an outstanding and colorful seafood soup with a generous amount of clams, mussels, shrimp, octopus and squid. The seafood was complemented by carrots, and both red and green cabbage swimming in a spicy orange broth with thick noodles. It was a huge portion and an impressive bargain when considering its expensive ingredients. Ginseng chicken soup ($15.95) was excellent, tasting much like a soup an American grandmother would feed you when you’re not feeling well. It contained a nice chunk of tender meat on the bone, with sweet rice, dried dates, garlic and lots of green onion in a soothing broth, and it arrived bubbling hot. Ginseng is prized for its medicinal properties, but as a flavor it didn’t really register. Salt, pepper and sesame seeds arrived separately, in little bowls so you could season the soup yourself. Bibimbop ($9.95) is a one-dish meal that is cooked and served in a rock bowl. Steamed rice goes in first, then bean sprouts, sliced carrots, spinach, and sliced pork, and all of it’s topped with a soft-cooked egg that is meant to be stirred in with the other ingredients. Hot sauce is served on the side, and chicken, beef or tofu can be substituted for the pork. Galbi ($18.95) is marinated grilled beef short ribs on the bone, set on a bed of lettuce and served with rice and miso soup. The meat had a terrific flavor, though it wasn’t especially tender. And at the end of the meal, during which service was friendly and prompt, we were offered — instead of a mint — a stick of gum, and it hit the spot.